Over two years ago, Electric Objects made waves by releasing its first product, EO1. 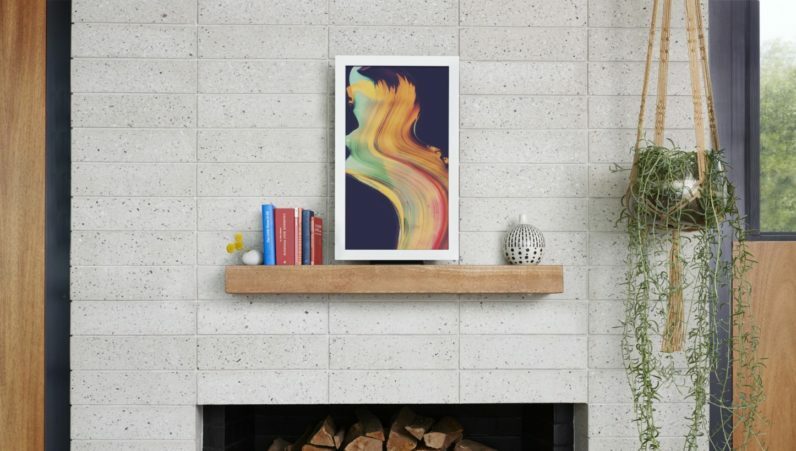 It was the first internet-connected digital art frame in the world — and it’s about to enter its next generation. With today’s launch of EO2, the company has made significant improvements. The 23-inch, 1080p LCD screen has been designed to minimize glare and now sports ambient light sensors to brighten, dim or turn off the display depending on activity in the room it’s placed in. It’s also twice as bright as the previous version, which should make for a better viewing experience. The devices’ profile has also been reduced to being less than 2 cm thick, and there are 4 handmade wooden frames sold seperately that seem to complement it rather well. You can upload any digital art you own — moving or static — through the EO app, or browse over 20,000 artworks already uploaded by the community that you can immediately put up on the display. If you want a more exclusive experience, EO2 now also offers a new subscription service called Art Club. For $9.99 per month, you get access to curated art specifically commissioned for the device, as well as art from museums like Los Angeles’ LACMA and Amsterdam’s Rijksmuseum. Coming soon, you’ll also be able to get live art shows streamed straight to the device. I’m a big fan of art in all its forms, and think the EO2 might be a great improvement over the last version. There are so many beautiful images and GIFs out there to put on the screen that you could have an unlimited amount of art on your wall. Art Club seems like an interesting development, but I don’t know if it’s for me — especially with the thousands of artworks available for free through the app. However, I do see the appeal in art created specifically for the dimensions and features of the EO2, so it’ll come down to the quality of the curated art. EO2 launches today for $299 on Electric Objects’ website.